Are Cosmetic Procedures for Seniors? MDPen / Blog / Are Cosmetic Procedures for Seniors? As our medical treatments continue to advance, we are living longer. According to The Statistics Portal, the life expectancy in North America for a baby girl born in 2018 is 81 and for a baby boy it’s 77. Our quality of life is increasing, and surgeries such as hip replacement and knee replacements are improving, giving people more mobility and ability to enjoy life. With all the advancements in cosmetic surgeries (both surgical and non surgical) and the decrease in the cost of many of these procedures, more people are investing in cosmetic procedures as they desire to look as young as they feel. But what about seniors over the age of 65? Should a senior invest in a cosmetic procedure? What are the risks and benefits? MDPen supports professional microneedling practitioners through providing micro needling training courses, the best serums for microneedling, numbing agents, and microneedling equipment. Our mission it to make it easier for microneedling practitioners to bring this amazing anti-aging non invasive cosmetic procedure to you. Below, we’ll explore cosmetic procedures for seniors. SHOULD SENIORS GET COSMETIC PROCEDURES? Overall health. Consider your overall health and your personal risk factors. Are you obese or are you a healthy weight? Do you have heart problems? Is your cholesterol high? Have you had a previous heart attack or mild stroke? Are your prone to blood clots? Do you exercise and maintain a healthy diet? Be honest with yourself when answering these questions. 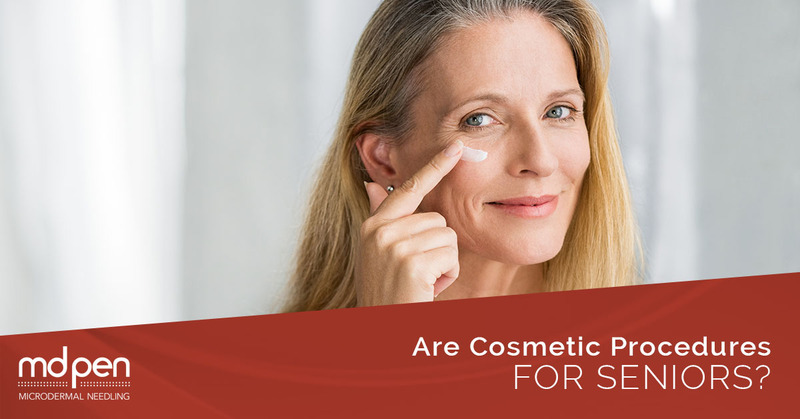 A non invasive cosmetic procedure has very little side effects; however, these are good questions you should be asking yourself anyways and frequently. Evaluating your health, especially as you get older, is crucial to hitting the average life span age. Risk factors. We touched upon this in the last point. Examine your health history and see if there is anything that might stand out that might prevent you from getting a non invasive cosmetic procedure or a surgical one. Some things to consider also include lifestyle habits, such as smoking and substance abuse. Again, be honest with yourself on where you stand. Medications. If you are taking a medication regularly, make sure it won’t interfere with any recovery process you will have with a cosmetic procedure. Some prescription drugs do not mix well with others you might be prescribed for healing after a cosmetic procedure or may increase your chance of a potentially dangerous health condition, such as blood clots. Skin conditions. Do you have any inhibiting skin conditions (or any others for that matter) that would preclude you from getting an optional non invasive cosmetic procedure or a surgical one? Some, such as shingles, are temporary, so it may just be a matter of waiting for it to clear up before you schedule your procedure. Desired results. Here, you’ll have to rely on the professionals (your potential cosmetic practitioners) for advice on your specific cosmetic procedure. Meet with your practitioner first to determine if the cosmetic procedure you are desiring will give you the results you want. A better option may exist for you. See your primary physician. With any type of elective procedure, it’s always wise to seek the advice of your primary physician, especially if it’s been a while since you’ve had your health evaluated. Often, we think of ourselves as healthy when a visit to the doctor reveals an aberration we’ve missed, such as a heart palpitation. Get a clean bill of health before your non invasive cosmetic procedure or surgical one. Advances in medicine are staggering when we think of where humanity was 1000 years ago. During ancient times, you could expect to live a mere 25 years. It increased to age 33 by the Middle Ages and reached age 55 by the early twentieth century. We are truly blessed to live in such a time and live to such an age. The advances in cosmetic procedures have advanced in parallel to modern medicine somewhat, but has really taken off in the last few decades. Today, the options for turning back the clock are many. And options are a good thing. MDPen is passionate about microneedling as an amazing non invasive cosmetic procedure that fights the signs of aging such as fine lines and wrinkles, and can change people’s lives by diminishing the appearance of acne scars and stretch marks. We support professional microneedling (spa owners, nurses, physicians, and aestheticians) practitioners as they are on the front lines of changing people’s lives. We offer microneedling equipment such as microneedling pens and numbing agents. We offer supportive material such as patient brochures. We train new microneedling practitioners in our micro needling training courses. We produce a proprietary line of skin care products, including the best serums for microneedling, designed for the patient in microneedling before and after care. We also offer ongoing training opportunities for microneedling practitioners in our microneedling workshops that help to keep practitioners abreast as technology continues to bound forward. We even offer a professional practitioner database to help you find the nearest MDPen microneedling practitioner near you. MDPen believes you should look how you feel if that is on your heart no matter what age you are. The world doesn’t stop just because you turn 65 and hit retirement. In fact, we believe the world is more open to you than ever before. In this day and age, there is nothing wrong with using the advances in medical care to look better, which most likely will improve your overall mental well-being as well. Microneedling can work wonders on seniors who are seeking a more youthful appearance. Visit our website and our news page for up-to-date news on changes in non invasive cosmetic procedures, including microneedling today!